We had been pedalling for almost an hour, our noses red and our breath making small clouds of condensation with every exhale. As we rode our bikes side-by-side in silence, we took in the beauty of the Okanagan River Channel that flowed peacefully beside us. In the Summer months, this is the hub for warm-weather fun in Penticton, where locals and visitors flock to float on tubes down the river that connects one lake to another. But on this day, the river was quiet, with only a gaggle of geese on its cool surface. Skaha Lake was our destination, and when we arrived, the view was breathtaking. While the day was chilly, the glasslike surface of the lake mirrored the calm sky that skulked above. The view was worth the trek, and we stood together grinning as we took it all in. This was the perfect way to start our mother-daughter trip to Penticton, where we would explore the city by bus, seeking new adventures and bonding over our weekend getaway to The District of Okanagan-Similkameen. 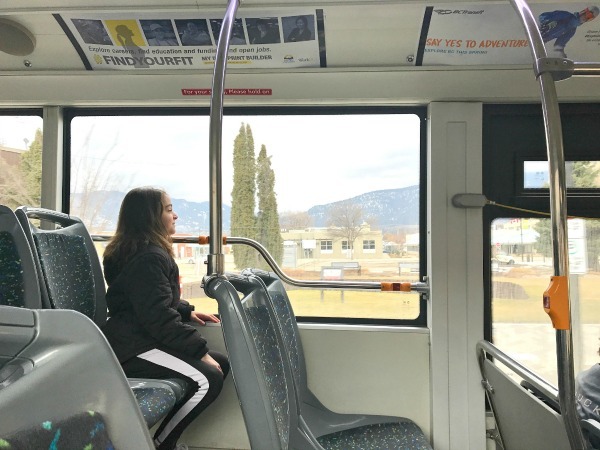 Based on our recent excursion, here are 4 ways you too can peruse and play your way through Penticton – and all of these fun spots are accessible by bus. Whether you’re a cycling enthusiast or a biking newbie, Freedom Bike Shop is a must-visit spot. Not only can you buy top-of-the-line mountain and street bikes or get a tune up from this great local shop, but they offer biking lessons and round-the-year rentals so you can explore Penticton by bike whenever you feel like going for a ride. Leave your car at home and visit the shop by bus – BC Transit buses are equipped with bike racks so you can hitch a ride to and from your biking destination if the weather takes a turn for the worse or if your legs are too tired to pedal on (the bus definitely saved us when we took a wrong turn and got lost at the other end of town!). This hidden gem is is a book lover’s paradise! With over 5,000 square feet of floor-to-ceiling literature, The Book Shop is one of Canada’s largest used book stores, and a treat for anyone looking to explore their favourite subject matter through the written word. Not a book lover? The Book Shop also offers over 20,000 videos and DVDs for rent! This is a great spot to peruse after a chilly day outdoors, and the perfect place to pick up a gift or keepsake. My daughter and I left with 8 books! Whether you’re an outdoor enthusiast or an indoor adventure type, Hoodoo Adventures is your go-to spot in Penticton. We started our visit with a beginner’s lesson in belay-style indoor rock climbing, where Emma nailed the figure 8 knot and scaled the walls like Spiderman’s quicker, more agile younger sister. We then tried the 15-foot-tall bouldering wall, where we solo-climbed sans ropes. It was fun to switch back and forth between climbing styles to figure out which worked best for us. Not only does Hoodoo Adventures offer an indoor climbing gym, but they offer a wide range of outdoor activities as well, such as outdoor rock climbing, kayaking, hiking tours, and snowshoeing – which would be our next feat. We geared up into our warmest snow gear and headed up Apex Mountain with our friendly tour guide. Once we reached our starting point, we strapped on our snowshoes and scampered along the snow, stepping swiftly through the powdery surface while catching snowflakes on our tongues. We took a trail that wrapped around the 3 lakes that sit tucked tightly amongst the trees and took in the views as we stopped for hot chocolate. This was definitely Emma’s favourite adventure, and hopefully a new one that we can continue to enjoy together back home. Hoodoo adventures I’m adding to my bucket list for next time: The Kayak Kelowna Wine & Cheese Tour, and The 3-Course Fireside Dinner & Snowshoeing Tour – how amazing do these sound!? We had such an amazing time bonding while exploring a new spot in BC, and can’t wait to see what else our beautiful province has to offer. To learn more about how you can #ExploreBCByBus, check out these great destinations and pre-built itineraries designed with families in mind. Who knew so many adventures could be had in one day? Guess that’s what happens when you choose to #ExploreBCbyBus!